This month a Cena is celebrating its Wine Lists. a Cena has an extensive wine list, reserve wine list and wine by the glass. Each of these lists brings an extensive and marvelous variety from most of the important wine growing regions of Italy. In October we are featuring many regions ion our wine lists. Pick from the Red Wine list below and you might guess that the varieties of these regions are awesome. The pairing of our wines with our authentic menu items and the seasonal and vintage changes are coordinated by our executive chef and our sommelier. Below are some of our featured choices that might be suggested by our staff. Check out our lists: Wine; Reserve Wine; and Wines by the Glass, Beer, and Cocktails. 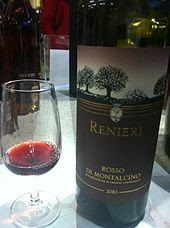 A Rosso di Montalcino made from 100% Sangiovese in the Brunello di Montalcino region. The Rosso di Montalcino DOC was established in 1984 as a means of giving Brunello di Montalcino producers the flexibility to continue the tradition of long aging of the region’s flagship wine. Rosso di Montalcino is made from 100% Sangiovese grown in the same delineated region as Brunello di Montalcino. Castiglion del Bosco is located in the northwest of Montalcino, where the rocky, nutrient-poor soils are perfect for yielding wines of superb structure and complexity. The estate’s 2,000 hectares are largely occupied by dense woods of holm oak, oak, and beech, in addition to meadows, organically-farmed crops and 62 hectares of vineyard planted exclusively to Sangiovese. There are two completely distinct growing sections, each different as to aspect, soils, and weather conditions: the 20-hectare Gauggiole vineyard, just beneath the borgo, and Capanna, with 42 hectares. Travaglini owns 59 hectares of land in Gattinara, 44 of which are planted with vines. Nebbiolo, or Spanna as it is locally known, is the main grape cultivated and the vines are between 6 and 45 years old. A small parcel is dedicated to Vespolina and Uva Rara, two native varieties used in the production of “Cinzia” wine. In order to achieve the best results, all vines are planted facing south and southwest and trained using the Guyot trellis method. Planting density varies according to vine age, with the older plants at 3,500 vines per hectare and the younger plants at 5,000 vines per hectare. The Nebbiolo grape is unanimously considered among the noblest in Italy and abroad, particularly for achieving an austere wine capable of long aging. Below, you’ll see notes on the major varieties and corresponding regional wines. Wines are organized by regional distribution, with the most widely planted varieties listed first. The Pio Cesare winery was founded in 1881 by our great-grandfather Cesare Pio. He was one of the very first wine producers to believe in the great potential and quality of Barolo, Barbaresco, Barbera and in the other great wines of Piemonte. Cesare Pio in the second portion of 1800s, was among the very first winemakers to produce these wines with a philosophy that was dedicated to the terroir and the strictest quality of the wine. For five generations, the Pio Cesare family has been producing traditional Piemontese wines in its ancient cellars, located in the centre of the town of Alba. Loved for its lower acidity and soft, fruity flavors of plums, blackberries, and raspberries. Dolcetto wine often has lifted floral aromas of violets and black peppercorn that are contrasted with firm tannin texture (that can come across as similar to chocolate). Exceptional producers are found in both DOCG and DOC areas (especially Alba) and because of the lower acidity, most recommend drinking the wine within 5 years of release. The most exalted red wine variety of Piedmont is Nebbiolo. This wine is striking to experience because its delicate, pale, brick-red color and floral cherry and rose aromas are completely contrasted by somewhat aggressive, chewy tannins (particularly in wines from Barolo). Because of its structure, you’ll find that Nebbiolo wines are a favorite for wine collectors who will happily set aside wines to open them decades later to reveal a delightfully soft and delicate wine. Even though Nebbiolo has a reputation for tannins and long-term aging, many of the sub-regions (Langhe, Alba, etc.) produce softer styles with a similar weight to whole-cluster Pinot Noir. The history of Etna is studded with the historic eruptions which have shaped it. The legendary one of 1614, lasting ten years and the longest ever recorded, halted right on the border of the vineyards of Sciaranuova. A strongly evocative name for our Cru dell’Etna based on Nerello Mascalese. High black lands confer an elegant style, refined and balanced. Join us soon for these and many MORE WINE CHOICES PAIRED WITH THE MOST EXCITING Autumn food.